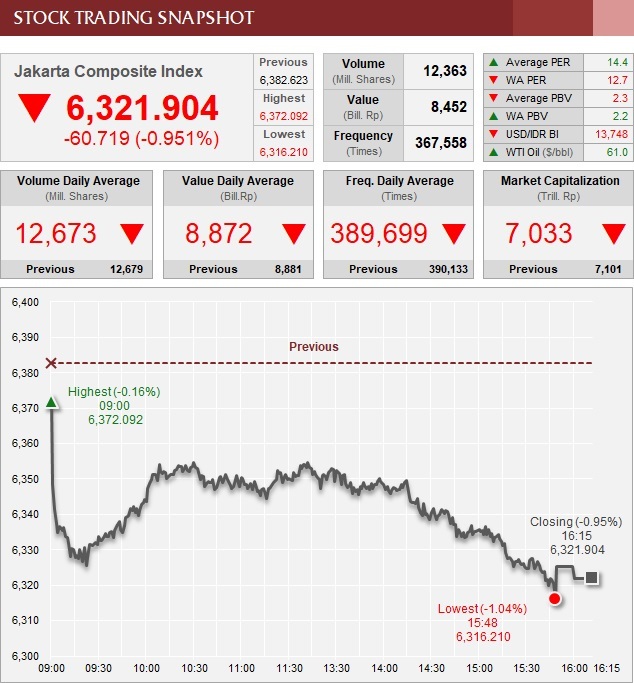 Amid mixed markets in Asia, Indonesia's benchmark Jakarta Composite Index fell 0.95 percent to 6,321.90 points on Thursday (15/03). Asian markets were plagued by the same negative market sentiments that caused the Dow Jones Industrial Average and S&P 500 to suffer their third consecutive daily decline overnight. Investors continue to be alarmed by trade policy changes initiated by the USA and possibly responded by other nations. After earlier having imposed import tariffs on steel and aluminum, US President Donald Trump now announced that his administration targets to trim the US's trade deficit with China by USD $100 billion via the implementation of more tariffs. Reportedly, Trump wants to impose import tariffs on up to 100 products that are manufactured in China. This would ease the US's rapidly widening trade deficit with the world's second-largest economy. In 2017 the deficit reached USD $375 billion, up 8.1 percent from the preceding year. Moreover, Larry Kudlow, who replaced Gary Cohn as Trump's top adviser also takes a tough line on China, indicating that the USA and its trading allies should take trade action against China, hence exacerbating concerns that a 'trade war' could be sparked soon. Meanwhile, US stocks were also affected by concerns that consumer spending has eased in the USA as retail sales data unexpectedly dropped in February (for a third consecutive month). Indonesia's benchmark Jakarta Composite Index has now erased all of its gains in 2018. The index had touched an all-time record high on 19 February 2018 but is now back at a level that was last seen around the year-start. Meanwhile, the Indonesian rupiah depreciated 0.11 percent to IDR 13,749 per US dollar (Bloomberg Dollar Index). Political turmoil is expected to continue as Trump also announced that his administration will impose new sanctions on Russia for meddling in the 2016 US presidential election.